There has been an escalation of instances in Bowers Beach of aggressive dogs. Please abide by the law and everyone, including the dogs will be safe. Also, residents/visitors are not picking up their dogs waste. Do not allow your dog to “go” on others property. Please be responsible and pick up after your pet. Lets help keep our town safe and clean! 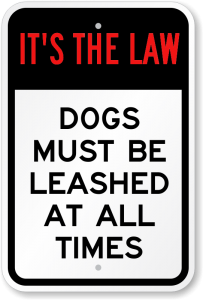 IT’S THE LAW: In many areas, dogs MUST be on a leash. Many of the reasons for this are found below. It can be very costly if your dog is seen by an officer or ranger or if your dog is involved in an incident while off leash. Aggressive Dogs: Just because your dog is friendly does not mean that the dog he’s meeting is nice. If the aggressive dog is on leash and bites your off-leash dog, you will not be able to collect any money for your dog’s vet bills and you will likely be fined for having your dog off leash, even if your dog does not survive the attack. Fearful People: Many people of all ages are afraid of dogs. Not only is it rude to allow your dog to frighten people, it could cost you. If your dog causes a fearful person to get hurt in an attempt to get away from your dog, you could be held liable for the medical bills. People have a right to protect themselves from a perceived threat, so even if your dog is friendly, if they see it as aggressive they can hurt or kill your dog in self-defense and you have no legal recourse. Poison: Your dog could get into something poisonous like antifreeze or into dangerous trash like cooked chicken bones before you can stop him/her. This can cause large vet bills or death of the dog. Chasing: Your dog could chase wildlife into a street. If your loose dog causes an auto accident, you can be responsible for the car repairs and medical bills. If your dog chases a child into the street, your problems could be much more substantial. Ban on Dogs: It is often the actions of just a few irresponsible people that cause a location to ban access to dogs. If you break the rules or laws, you are one of those irresponsible owners, regardless of the training level of your dog. Mind of Their Own: Sometimes, dogs have a mind of their own and even a well-trained dog can choose to disregard your “come” call or known “boundaries”. Please don’t rely on only training to contain your dog and keep him/her safe. Small Dog = Prey: Many small dogs have been killed by bigger dogs because they are seen as a prey animal. If your small dog is off leash when it gets attacked and possibly killed, especially if the attacking dog is on a leash or contained in a yard, then you may have no legal recourse for compensation. All Dogs Can Bite: Without a leash, you have no control over the situations your dog could get into. If someone threatens your dog to a point that it feels it needs to defend itself, your dog could bite. This could cause you to be liable for the injuries caused by that bite. It’s The Responsible Thing To Do: The people you see on the news with dogs that caused horrific situations never expected that they would be in that situation. No one expects to be the owner of a dog that causes a death or that gets killed or that bites someone. However, you can greatly reduce your chances of that happening if you act responsibly and as an ambassador for good dogs everywhere. Keep your dog safe by keeping a leash on.